The aim is overseas expansion. Since 1991, our company has started as integrated factory of plating and cutting-work. We have the basic philosophy of technique, confidence, and creation, and then set ourself the goal of becoming the world-class operaying company. The members of plating and cutting-work, buckle to acquire technologies to become Meister. Also, after the Support Industry Program had been adopted in 2012, we newly set up the laboratory office. And then, the development members consisting on college grad, make a strong effort to developing technologies, and aim to become Doctor too. By synergy of Meister's technique and Doctor's development capability, we aim to expand overseas not only at home but also mainly in Asia, as the maker of component manufacturing the unique technologies. 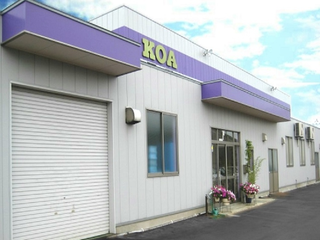 Company name ko-a Co. Ltd.
May 1991 The factory of ko-a Precious Metal Craft in Hirosaki began operation. February 1998 ko-a Co. Ltd. was established for establishing basic technique of plating and machining. December 2003 Get the authentication of Environmental Management System (KES). January 2005 Get the authentication of ISO 9001 (ver. fiscal 2008). June 2009 The capital of our company was increased to 10 millionn yen. January 2014 Get the authentication of ISO 14001 (ver. fiscal 2004). January 2014 The capital of our company was increased to 14 millionn yen. March 2016 Get the authentication of ISO 14001 and 9001 (ver. fiscal 2015).